The Balcones Canyonlands National Wildlife Refuge offers great Texas Hill Country vistas and hiking trails, especially for bird watching. Designated as a Globally Important Bird Area, significant for world bird conservation, entrances to the Refuge are only about an hour from our Mustard Seed Bed and Breakfast on the Llano. Visitors can look for some of the 245 different bird species there during part or all of the year, including over 100 migratory birds that winter south of the border. The American Bird Conservancy recognizes the Refuge for its role in conserving habitats for the golden-cheeked warbler and the black-capped vireo. Admission to the Refuge is free. National Wildlife Refuge Week, October 14-20, 2018, makes October a great month to visit Balcones Canyonlands National Wildlife. In addition to serving as an important habitat for birds, its home to wildlife such as raccoons, ringtail cats, and salamanders, plus many insects and cave dwelling arachnids. The fall months are great for birding and hiking. Spring transforms the Refuge with brilliant bluebonnets, Indian paintbrush and the butterflies they attract, while summer brings all kinds of dragonflies to its meadows, ponds, and streams. Visitors can enter the Refuge from the south (Ranch Road 1431) for the closest access to Warbler Vista and Sunset Deck, open daily from sunrise to sunset. Three different trails provide access to golden-cheeked warbler habitat as well as wonderful vistas across the Hill Country. Near the northern entrance (Ranch Road 1869), the area around the Shin Oak Observation Deck provides the best habitat for black-capped vireos. The Observation Deck is open sunrise to sunset excluding March and April. There are no trails at this location. Doeskin Ranch Public Use Area offers over five miles of trails, including several short half mile walks: the Pond and Prairie Trail and the Creek Trail. The more challenging 2.2 mile Rimrock Trail leads to a location with panoramic vistas. These trails are open sunrise to sunset, daily. The birding blind and two short trails at the Refuge Headquarters are open only Monday – Friday during business hours. The easy 0.4 mile Post Oak Creek Trail follows the creek to reach the 0.16 mile Pollinator Path. These trails are great for viewing migratory birds. For more information about the Refuge, its birds and trails, visit their website. Additional resources are the Friends of Balcones Canyonlands and the Texas Ornithological Society. Whether you make plans to visit the Refuge during the fall, spring, or summer, start by reserving your room at our B&B – our three unique rooms book quickly! Hiking and birding are just two of the many outdoor activities you can enjoy during your Llano stay. Fishing, canoeing, kayaking, and golfing area just some of the others – the Texas Hill Country is an outdoor lovers’ paradise! Refuge Headquarters: Open from 8:00am – 4:30pm, Monday through Friday excluding Federal Holidays. Warbler Vista Unit, Doeskin Ranch and the Shin Oak Observation Deck are open sunrise to sunset daily. Admission: Refuge trails are free of charge. 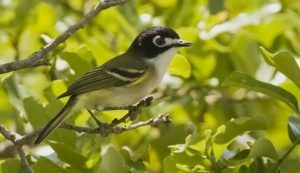 This entry was posted in Attractions, Outdoor Activities, Texas State Parks, Uncategorized and tagged Balcones Canyonlands National Wildlife Refuge, black-capped vireo, Globally Important Bird Area, golden-cheeked warbler, Hill Country B&B, Hill Country Birding, Llano B&B, Marble Falls TX, Tx birding, TX Hill Country hiking by admin. Bookmark the permalink.